← Roth IRA Conversions? Better Wait and See. My fiance and I are hosting Christmas this year, which for me means that my mom and stepdad are driving from my home town to spend the week with us, and my aunt is coming from about an hour away to feast. Sometimes my close friend will join us for the holidays, and sometimes she stays behind. We hosted Easter as well, and my cousin and her family dropped in to celebrate with us, too. By our estimate for Christmas, we’ll be feeding between 6-10 people. Being that we are getting married in seven short months, which will be funded by my fiance and I alone, we want to cut costs wherever we can (without sacrificing quality) so we aren’t in a tight financial position as the wedding costs start accumulating. I am normally not a fan of bulk shopping at places like Costco. Being that there are only two of us in our household, we never use up bulk groceries before they go bad, making it a wasteful endeavour. My coworker is also hosting her Christmas dinner, so we are teaming up to go shopping at Costco together. We’ll be purchasing everything except for the turkey in bulk (brussell sprouts, potatoes, cranberry sauce or fresh cranberries, bread for stuffing, etc) and then dividing it so that none goes to waste. This allows us to cash in on the savings without watching our money go in the garbage by food waste. Previous to this year, we’ve spent Christmas at my mother’s house, and her and I make dinner together. We always serve the turkey, mashed potatoes, stuffing, cranberry sauce, gravy, brussell sprouts, roasted carrots, beats, and another vegetable. There tends to be a ton of leftovers, and I suspect that many of them are wasted because they can’t eat them all. There is so much left over even after she sends me and my brother home with enough to last us for days. Instead of serving several vegetables, we may just serve one or two. That way we won’t waste, and it will be less expensive than serving a wide range. My aunt usually brings the dessert, which is a nice break because not only does it save us money, but it also saves us the time to have to make one. We’re asking our other guest to bring a bottle of wine so we can all share it over dinner. If you are hosting, you’ll likely be providing most of the food, but there is no harm in asking somebody to bring dinner rolls, appetizers, wine, or dessert to save yourself work and money. Be sure to find out what they are bringing before hand so that you don’t duplicate. There have been many years when a guest has brought a dessert, and we have made one so there is a lot of waste and duplication. Though I’m not complaining about more dessert! I’m not a huge fan of boxed, canned, or frozen food. I find boxed mashed potatoes to be unappetizing and I’d prefer to make my own cranberry sauce. Luckily, this preference also saves me some cash. It’s cheaper to buy potatoes than a box or two, and mash them yourself. It’s also much more tasty. We find that when we buy canned cranberry sauce, we end up throwing away a lot of it. We have started buying cranberries and making an easy cranberry sauce, then canning what we have left over for the next year (or for Thanksgiving the following year). It actually saves over the year. We are really excited to host our first Christmas, especially on the cheap. What are you doing to keep costs down? Are you hosting or being a guest this year? This weekend I’m planning to do some early groceries for our Christmas dinner. Usually during Christmas we celebrate it at home with my family. We already have some menus for what we are going to prepare. What’s your opinion on buying most of the boxed or canned food in November for Thanksgiving and Christmas? I find this does help sometimes with things like stuffing mix, hams, turkey, bread, potatoes (if you have a cool dry spot for storage), and veggies. I usually buy right before the meal, so I have limited experience in this. But it’s probably marked way up right before so this could be a good strategy. Good plan, Teffany. Planning ahead can help too. My extended family always does a pitch-in. We all bring 1 or 2 things and it makes it easier for everyone. We all take home leftovers as well. I hate wasting food! I hear ya – I hate wasting food as well. It’s nice that you don’t have to do as much work, with pitch in, either. I’m a big fan of the “cutting down.” I’ve attended many Holiday meal where the goal seemed to be to have as many side dishes as possible. Many of them have one or two spoonfuls taken out of them, and then the rest goes into the fridge…likely never to be eaten. I hate that because I just know those side dishes will be wasted! I remember the big meals of childhood. We had to have ten dishes of things crowding the table. I think that’s where all the turkey sandwich jokes came from. Over the past couple of years, when I was living with somebody, we cut it way down to maybe two vegetables, meat, rolls, and dessert. This past Thanksgiving I was living alone so I teamed up with the neighbors, sharing food items and cookware in exchange for a good meal and a small amount of leftovers. Bread can be frozen, when you find a good sale for it. I tried once to make my own, but that is way more work than I want to get into. Cranberry sauce is a waste to me since no one I ever knew finished a whole can in time. One thing that people can do, is just put out dishes and food in the kitchen; then use an assembly line or cafeteria style setup. That eliminates the desire to have tons of food on the table, and keeps the dishes to a minimum. 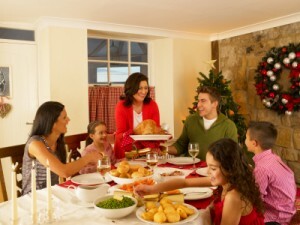 The cafeteria style approach is what we do at my mom’s when we go there for Christmas or Thanksgiving. Good suggestion. We are hosting the family this year so will be making a trip to Costco for sure. But those coming will be bringing dishes as well so that should help with the cost of the meal. That’s really helpful. That way you’re only responsible for some of the cooking! My grandparents usually pay for everything, and having hosted smaller parties I realize how much money goes into just one meal. But it is a great memory, and we don’t do gifts for adults so we save on that. Perfect – the gift of spending time together and sharing a meal! I host the big meal these days and there will be the turkey, with gravy, mashed potatoes, cooked mashed turnip, maybe some cooked carrots, a salad and rolls along with cranberry sauce. I try to cook things like the turnip and cranberry sauce the day before as well as cutting up left over bread bits from the freezer for the stuffing. The potatoes, cranberry sauce, and stuffing will all be home made. My daughter will be here with the grandson and she is bringing a cake for dessert. I bought my turkey back in Oct. when it was on sale for a very nice price and tossed it in the freezer for now. After we clean up the leftovers I will be cooking the turkey remains to make stock that will go in the freezer along with any leftover meat to make turkey soup at a later date. I have saved in the freezer all the leftover bits of bread that tends to not get eaten like the crusts for the stuffing and for home made bread crumbs. I use my freezer for a lot!! There is very little waste around here!! My mom uses the leftover bread tip, too! Sounds like you are very on top of it.